Humans are the only large creatures that can stand on two feet continuously. We owe the stability to achieve this to 26 bones, 33 joints and 19 muscles and tendons in each foot and ankle. Consequently, these parts of our musculoskeletal system literally determine how firmly we stand in our shoes. If arthritis forms in one or more joints, your balance and posture may be negatively affected. 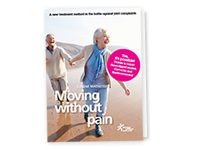 In most cases, ankle osteoarthritis and foot arthritis is the result of natural wear and tear, as the joints in the ankles and feet need to carry a heavy burden. Osteoarthritis can affect all 33 joints in the foot and ankle. However, the joint that is most susceptible to wear and tear is that of the big toe – to be precise, where the first metatarsal bone is connected to the first phalange of the toe (circled in blue on the image below). 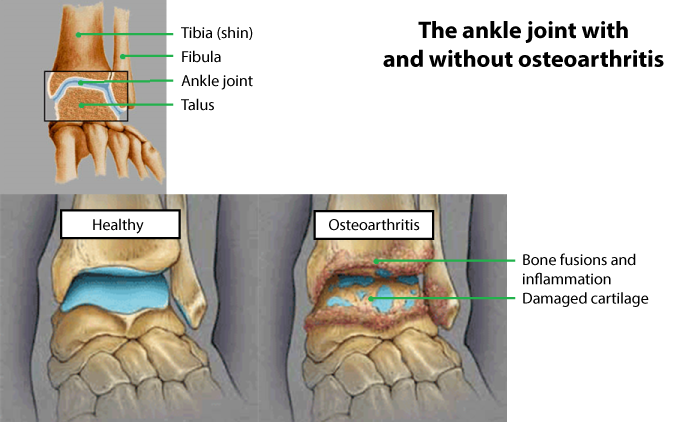 Osteoarthritis can also occur in the three joints of the rear foot and the ankle. In this case, the joint affected is the one of the shin resting on the upper bone of the foot (also known as the ankle joint). 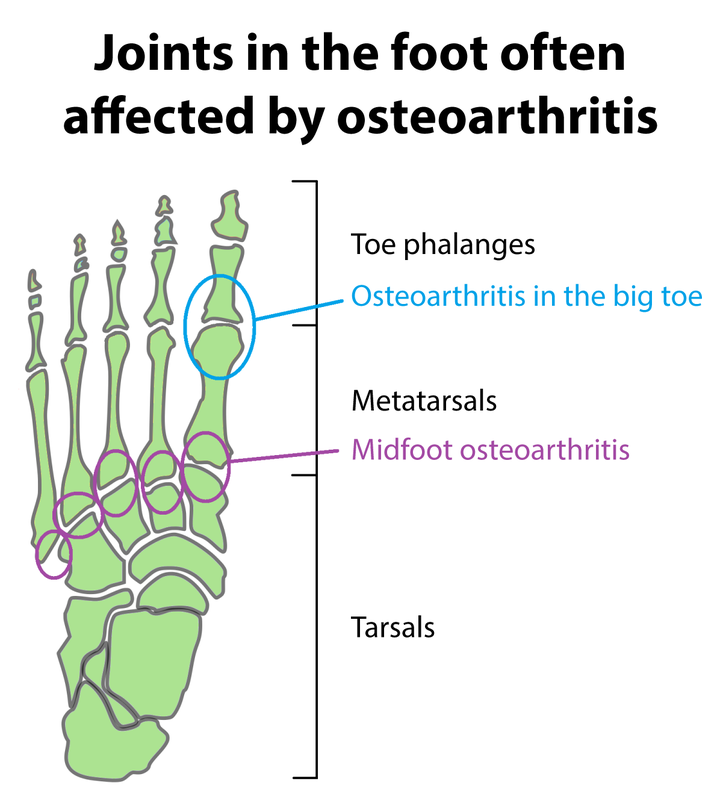 Arthritis is often also diagnosed in the joints that connect the metatarsals with the smaller tarsals (circled purple on the image below). What causes osteoarthritis of the ankle, foot and toe? The main cause is primary arthritis, which is caused by ageing. It is the result of natural wear and tear that affects us all as we get older. The joint’s layer of cartilage starts thinning until it eventually disappears virtually completely. Consequently, the two bones touch. Joint inflammation can also affect the cartilage in the joint, for example in case of rheumatoid arthritis. The cartilage is then damaged and it can eventually disappear completely, which is also called secondary arthritis. With this condition, the accelerated thinning of the cartilage is not caused by ageing. This category also includes arthritis caused by damage to the cartilage, for example due to bone fractures or other lesions. Wearing the wrong shoes for long periods of time or moving the wrong way, for example, can cause cartilage to wear very quickly. What are the symptoms of arthritis of the ankle, foot and toe? Wear and tear in the joints results in the elastic, shock-absorbing cartilage to disappear, either partly or completely. As a result, the affected joint loses suppleness. Increased friction between the bones causes pain and fluid build-up, causing the foot and ankle to swell up and press against the nerve endings, once again resulting in pain. It then becomes hard to move the foot or ankle. Moreover, new bone tissue can form around the joints. This way, the body tries to spread the pressure over a larger surface. How is osteoarthritis of the ankle, foot and toe diagnosed? If you have mild to serious symptoms, the GP will refer you to an orthopaedic surgeon, who will diagnose the condition based on a questionnaire and a physical examination. Usually, the specialist will also ask you to walk around and observe your way of walking to check how the bones in your legs and feet move in relation to each other. He will also take an X-ray of the foot or ankle to see which joints have been affected by arthritis. How is osteoarthritis of the ankle, foot and toe treated? The orthopaedic surgeon will first try to treat the condition without resorting to surgery. Overweight patients will be advised to lose weight to reduce pressure on the joints. A cane or arch supports can also help you walk. The orthopaedic surgeon can also refer you to a physiotherapist to strengthen your muscles through exercise and maintain optimal mobility in the foot and ankle. Moreover, special shoes can be made with a hard sole that promotes a better gait cycle. An ankle-foot prosthesis can also provide additional support and allow you to continue using your foot and ankle as efficiently as possible. If you are constantly in pain, your physician can prescribe an anti-inflammatory. Bear in mind though, that this medication can have nasty side effects. 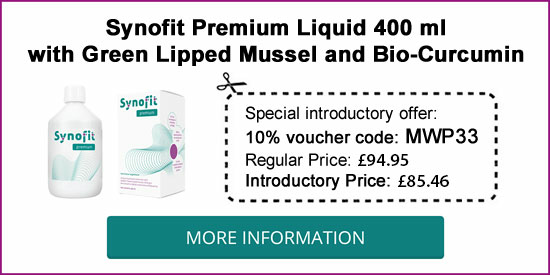 The good news is that there is a natural alternative based on liquid Green-lipped mussel and Curcumin. To date no side effects have been reported when using this natural anti-inflammatory and pain-relieving product. The liquid combination of Green-lipped mussel and Curcumin is sold at pharmacies, drugstores and health shops without prescription. When do I qualify for surgery for arthritis of the ankle, foot or toe? If the treatment methods above had little or no effect, surgery can be considered. The affected joint is then cleaned through keyhole surgery. This is a relatively minor operation that can considerably improve your quality of life. Another option is for the orthopaedic surgeon to join the bones together through arthrodesis, which eliminates the pain. The disadvantage of this surgical procedure is that the joint cannot be moved anymore. The image above shows an X-ray of a big toe following arthrodesis. This technique is often also used in the ankle. The specialist will only replace the ankle joint with an ankle prosthesis in exceptional cases. At present, this technique is not as successful yet as hip or knee replacement surgery, because an artificial ankle can become dislodged or malfunction relatively easily. Below you will find an exercise programme that aims to strengthen the muscles and promotes mobility of the ankle and feet. You should do three sets of each exercise, with a 30-second break after each set. Good luck! Sit on the floor leaning backwards, supporting yourself on your hands. Now pull your feet towards you as closely as you can. Count to three and push your feet as far away as possible. Make sure you keep your heels on the ground at all times during the exercise. Sit on the floor leaning backwards, supporting yourself on your hands. Make circles with your feet, first to the left and then to the right. Put a towel on the floor. Sit on a chair and place your foot on the towel. Try to curl and then stretch the towel with your toes. Make sure you keep your heel firmly on the ground at all times during the exercise. Sit on a high chair and place your foot on a ball. Roll your foot forward and backward as far as you can. Repeat with your other foot. Sit on a chair and place your feet flat on the ground. Slide one foot forward and then backward as far as you can. Repeat with your other foot. Make sure you keep your heel firmly on the ground at all times during the exercise.